5-MeO-DMT is a naturally occurring psychedelic present in numerous plants and in the venom of the Bufo alvarius toad. It is found in some traditional S. American shamanic snuffs and sometimes in ayahuasca brews. It is somewhat comparable in effects to DMT; however it is substantially more potent, so it should not be confused with DMT. What form does 5-MeO-DMT have to be in to be smoked? Do reactions to 5-MeO-DMT really vary THAT much? 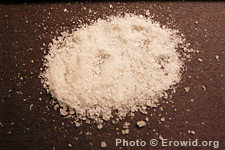 What are the defining characteristics of 5-MeO-DMT?